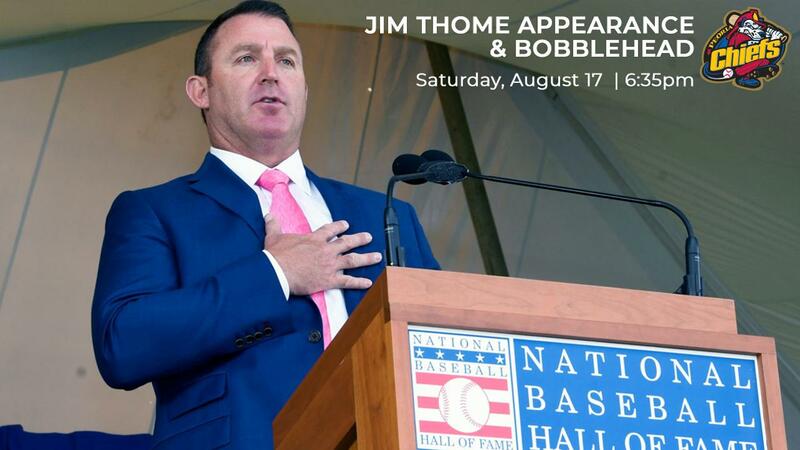 PEORIA, IL - The Peoria Chiefs have announced that Baseball Hall of Fame slugger and Peoria native Jim Thome will be honored prior to the Saturday, August 17 home game and the first 1000 fans 13 and over through the gates that night will get a Jim Thome Hall of Fame bobblehead. Though individual game ticket don't go on sale until March 1, tickets for Jim Thome Night are on sale through the Chiefs website or this direct link - http://goo.gl/9eJV15 for 24 hours until Wednesday at 2:00 p.m. CT.
Thome will attend the Chiefs game on August 17 against Wisconsin with a 6:35 p.m. start, his first formal appearance at Dozer Park for a Chiefs game. He will be honored on the field pre-game with a presentation and throw out a ceremonial first pitch. The bobblehead, currently in design, will feature Thome in his usual batting stance while wearing a Hall of Fame jersey. Thome was born in Peoria in 1970 and attended Limestone High School in Bartonville and Illinois Central College in East Peoria. A 13th round pick by the Cleveland Indians in 1989, Thome played 22 seasons in the major Leagues amassing 612 career home runs, 1699 RBI, 451 doubles, a .554 slugging percentage, 1747 walks and a .402 on-base percentage. Thome appeared in 71 career playoff games and his 17 post-season home runs rank seventh on the MLB all-time list. He was named to five All-Star Teams, led the NL in home runs in 2003, won the prestigious Roberto Clemente Award in 2002 and the Marvin Miller Man of the Year Award in 2001 and 2004. Thome was elected to the National Baseball Hall of Fame with 89.8 percent of the vote in 2018, his first year on the ballot. His number 25 has been retired by the Indians and he is a member of the Phillies Wall of Fame. August 17 is also Youth Sports Night with a post-game Fireworks show. The Thome bobblehead completes the Chiefs series of six bobbleheads for 2019. Earlier this month bobbleheads of former Chiefs Nolan Gorman, Jordan Hicks, Albert Pujols and Javy Baez were announced along with one featuring Recyclops from the hit TV show The Office. Season ticket packages and group tickets for the 2019 season are currently on sale by calling 309-680-4000. The 2019 season kicks off April 4 in Cedar Rapids, Iowa with the home opener against the Beloit Snappers set for Saturday, April 6 at 6:35 p.m. Individual game tickets will go on sale Friday, March 1 at 10:00 a.m.